Management Trainee (MT) (Technical), Assistant Engineer (AE), Accountant, Superintendent (General), Junior Technical Assistant & Stenographer. Central Warehousing Corporation, Mini-Ratna (PSU) released advertisement for the recruitment of Management Trainee (MT) (Technical), Assistant Engineer (AE), Accountant, Superintendent (General), Junior Technical Assistant & Stenographer. 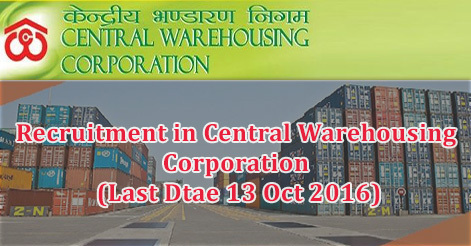 Central Warehousing Corporation invites applications from the eligible candidates to fill up 644 posts in various department. Accountant 18 Rs. 35227/- + Perks & Allowances Appx. CTC Per Annum: 6.0 Lakhs B.Com or BA (Commerce) or Chartered Accountant or Costs and Works Accountants or SAS Accountants of the Indian Audit and Accounts Department with three years’ experience in maintaining and auditing of Accounts in Industrial / Commercial /Departmental Undertakings. 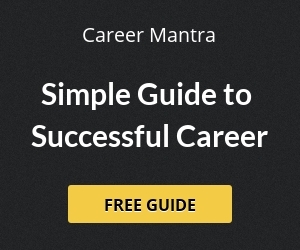 Selection will be done by objective type Written Test & Interview of shortlisted candidates. Candidates can apply online only from 20.09.2016 to 13.10.2016 and no other mode of application will be accepted. After sucessfully online registration Candidates are requested to submit application fee. In terms of fee submission, the Male candidates belonging to Unreserved (UR) and OBC shall be required to pay an online application fee of Rs. 400/- + Intimation charges of Rs. 100/-. SC/ ST/ Women/ PH/ Ex-Servicemen candidates will be exempted from the payment of application fee, however they will be required to pay intimation charges of Rs. 100/-. Applicable payment gateway charges for online payment facilitation shall be borne by respective candidate. Help us to improve this article/job posting "MT, AE, Accountant & Stenographer Recruitment in Central Warehousing Corporation". We would be glad if you can comment below and provide your valuable suggestions and feedback. If this page have any wrong information/list or out of context content, then you can report us as well.